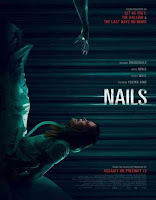 Nails 2017 | FunToMovies 300 Movies '+g+"
Story line: Dana Milgrom (Shauna Macdonald) is a track coach and mother who’s survived a near-death car accident, only to find herself paralyzed and trapped inside her own body. Forced to communicate via an artificial voice program and hooked to a breathing machine, she becomes convinced that a terrifying presence called Nails exists inside her hospital room. No one believes her – not even her own husband, who think she’s experiencing a mental breakdown. As her marriage disintegrates and her grip on reality starts to shred, Dana fights to convince the doctors and staff that Nails is real and intent on destroying her.